No Photoshop. No Illustrator. Just browser. 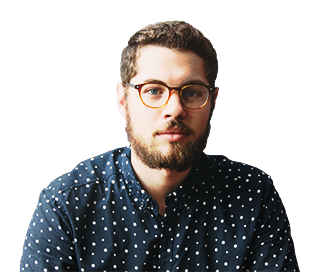 Design a clear visualization of your wireframe with your team. Yes!, you can design for Material style too! 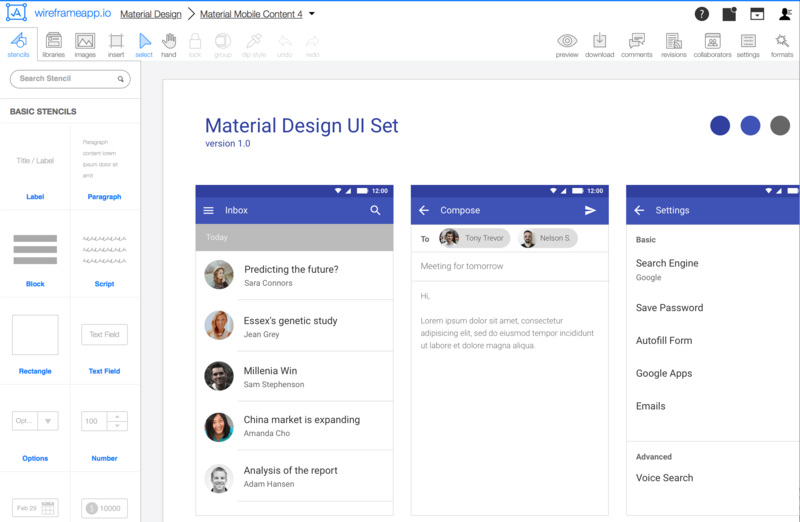 A simple to use web application that helps you create and collaborate on wireframes, mockups, diagrams & prototypes in realtime. Hot Spot allows us to link between pages in a project. By doing so, we can click elements on preview mode to quickly navigate around. Access all available stencils quickly and easily. Simply drag and drop into canvas the stencil we need. Occasionally, we might need to add some imagery. Upload images or choose from unsplash collections. When we have to work with multiple elements, these tools can help speed up our process. 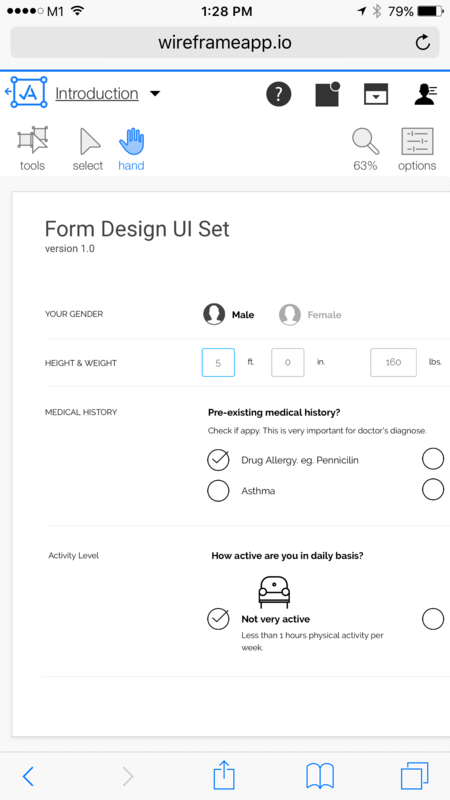 In creating design wireframe, often we will need to add the same items repeatedly. This can be easily done using this tool. 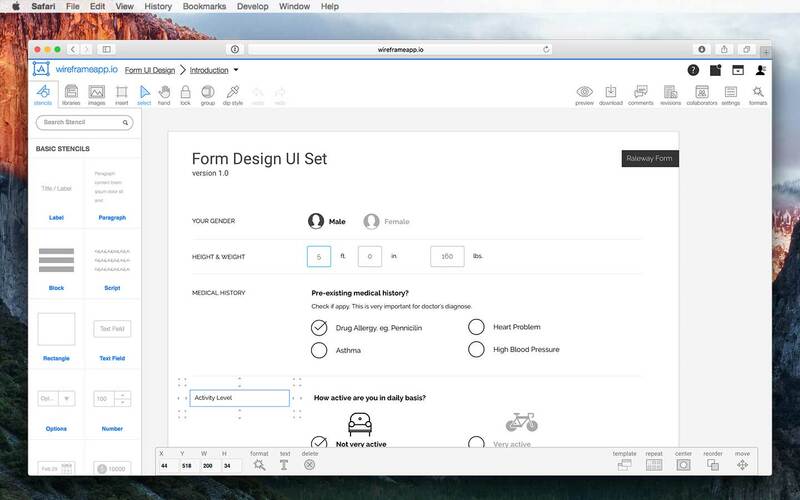 We can easily create wireframe design using existing UI sets and elements. That's all provided under this section. This panel helps us make adjustments to existing elements. Change to multiple elements is also supported. Download the whole project or individual page. Supported download formats are: SVG, PNG, and PDF. 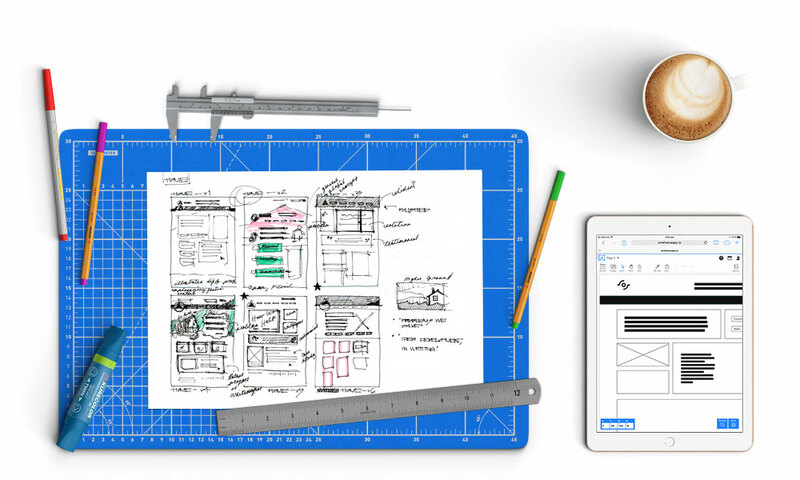 I could easily work with an iPad to work on wireframes. It’s especially useful when all the ideas are in my head after a meeting with my client. It is so easy to learn with barely any learning curve. I could easily link different screens to demonstrate the workflow, without the need to write code. Creating a wireframe for a quick brainstorming session is made easier with tons of stencils and icons already provided. You will finally have time to enjoy that cup of coffee or tea. work from any devices or web browsers. 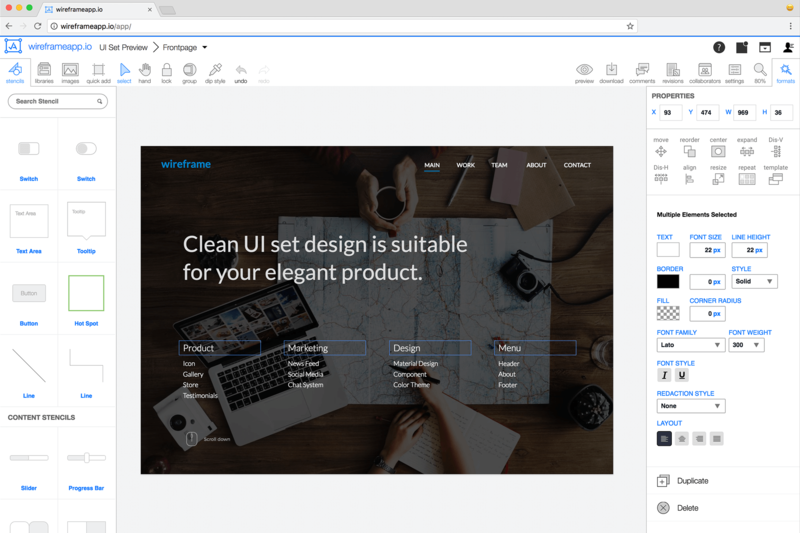 Whether you’re in a meeting with a client and wireframe your vision on a tablet, or at your desktop powering through an app idea with your colleagues, wireframeapp.io is compatible with all web browsers. When you're at the coffeeshop where 3G tethering is the only connection you get, wireframeapp.io loads super fast. It's so fast that you'd think it has been installed right onto your device. Yes, we mean it. The best tool to create your wireframe. Safe and secure storage backed up on the cloud, you'll never have to worry about losing your files. 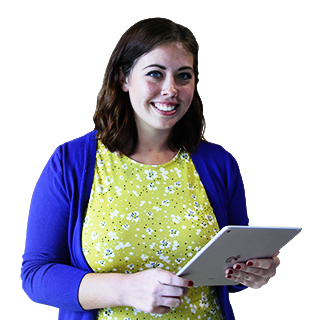 Create or present your wireframes on tablets or other touch-based devices. Link your pages to present your navigation ideas. 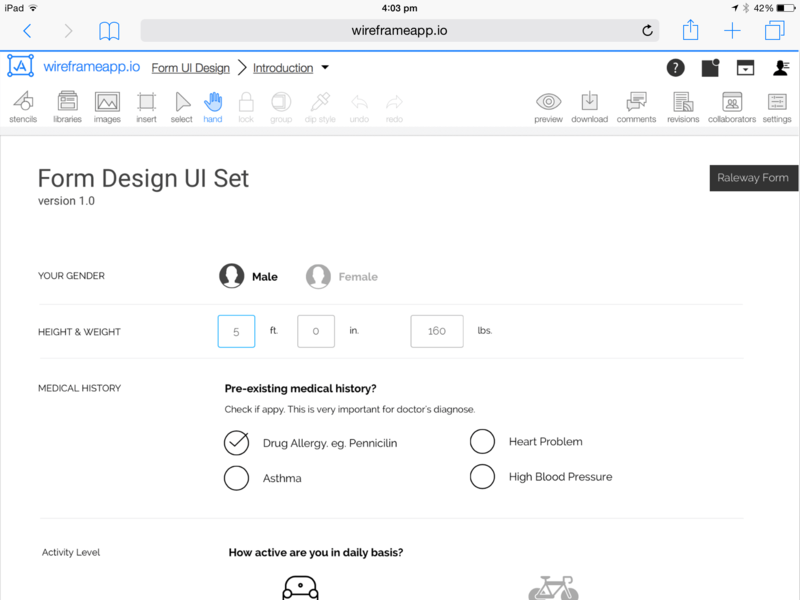 Enable your team and clients to mark up and comment on your wireframes. Built to be used even on 3G connections.